YORK COUNTY, S.C. -- In Peyton Robinson's eyes, the American flag should be displayed. But at his South Carolina high school, the senior ran into a problem, CBS affiliate WBTV reports. "Just proud to be an American citizen," the 18-year-old told WBTV. Robinson said a York Comprehensive High School administrator told him remove the American flag and the POW-MIA flag, which he has in the back of his truck. "He said, 'We're having some issues. Some people were complaining about the flags in your truck, possibly offend them.' He asked me to take it down," Robinson said. The high school senior, who has several family members who served in the armed forces, is upset because he doesn't see the problem. "I'd understand if it was a Confederate flag or something that might offend somebody," Robinson said. "I wouldn't do that. But an American flag - that's our country's flag. I have every right to do it." 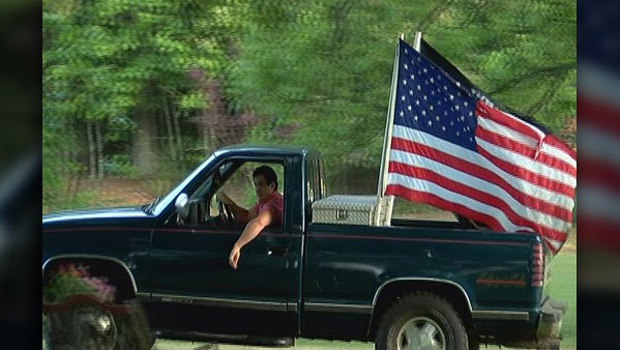 School district officials told WBTV that students were told they couldn't have any physical flags on their cars because of safety. Administrators said it was a pre-existing policy that was announced again Wednesday. Robinson said, "I don't see a safety issue. I mean I understand it's a big flag - it's 4 by 6 - but nobody's complained about it being in their way or anything." According to Robinson, a school administrator told him to remove the flags when he got home and not come back to school with them. But the 18-year-old said before the school day was over on Wednesday a school official went to Robinson's parked truck, removed the bolts that secured the flags to the truck, took the flags down, and "laid my flags down in the middle of my truck when I wasn't even there." "I was pretty mad," he said. "I don't see how it's a problem. Nobody has ever complained about it before." The senior took to social media and posted about the incident on his Facebook page. Fellow students vowed to stand with Robinson and fly flags on their cars when they arrived at school Thursday morning. Despite being told he's not to come to school again with flags flying on his pick-up, Robinson said he planned to do what he's done for the past month - display his flags. "I will ask to see where it's written you can't fly the American flag," he said. "I want them to know we have every right to fly the American flag on on our truck."